Doppelskope creates highly visual and interactive comedies that explore topics ranging from existential dread to ecological crises. We believe that the stories we tell about the world can change the world. We believe that audience interaction empowers people to be active participants in the world. We believe in the intelligence of children and the whimsy of adults. Our shows celebrate life and inspire connection, discovery and community. The name Doppelskope is a misspelled portmanteau of “doppelganger telescope” (imagine a telescope so powerful you can see the back of your own head). Doppelskope is the creative partnership between Ora Fruchter, Christopher Scheer and Toby Singer. Chris and Ora started as an experimental performance duo that made open-hearted new theatre to approach life’s darkest problems through comedy. 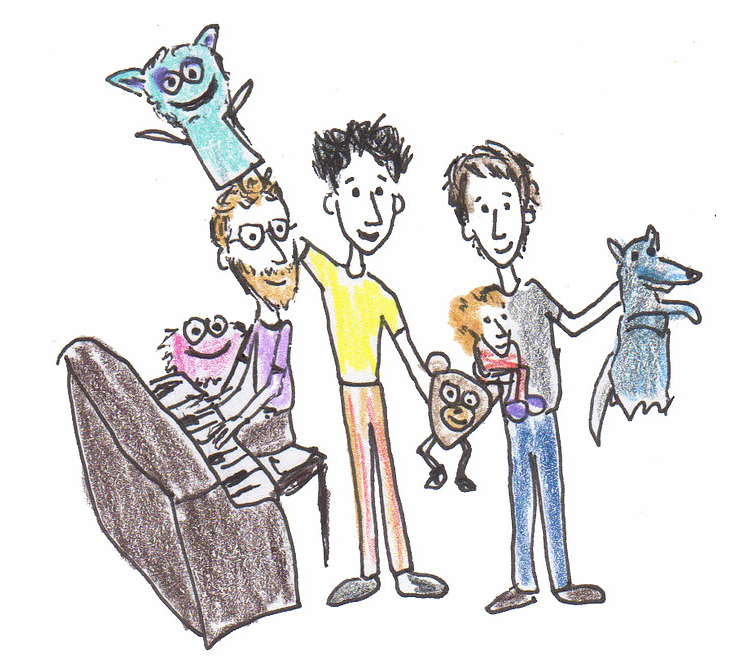 Toby then added his diverse musical expertise and together we created three off- the-wall, family-friendly, fairytale musicals. These shows explore environmental justice (Gruff! ), the relationship between humans and technology (Grimm! ), and the complex social ramifications of commerce (Growl!). They’re also uproarious comedies that highlight our unique hybrid of clown theatre and inventive puppetry. Gruff!, Grimm!, and Growl! (“The Grilogy”) premiered at Muhlenberg Summer Music Theatre from 2014-2016. This spring Doppelskope is launching the NYC premiere of Gruff! while licensees in Indiana and Maryland mount their own productions from The Grilogy.